Spring has been slow to arrive in Fort Collins this year. We have had 4 days of cold rain in the last week. 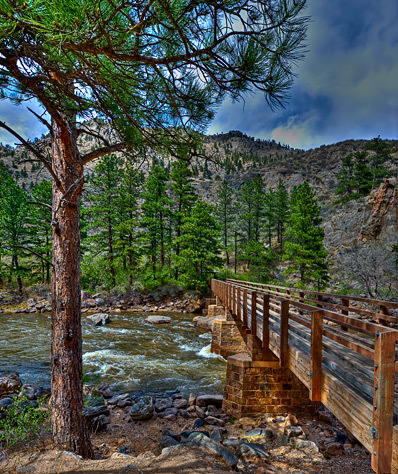 The scenic drive up Colorado 14 along the wild and scenic Cache la Poudre River is just a delight. There are many places to stop with river access and photo locations along the way. This footbridge crosses the river to allow access to the Gray Rock trail. While I was set up on the bridge taking pictures, a forest ranger crossed the bridge and said she has spotted a mountain lion about a mile down the trail! Yes I would love to get a pic but I am just not that brave. The river’s headwaters are in the Front Range in Larimer County, in the northern part of Rocky Mountain National Park. The river descends eastward in the mountains through the Roosevelt National Forest in Poudre Canyon. It emerges from the foothills north of the city of Fort Collins. The name of the river means “Hide the powder” in French. It refers to an incident in the 1820s when French trappers, caught by a snowstorm, were forced to bury part of their gunpowder along the banks of the river. The river is a popular summer destination for trout fishing, whitewater rafting, tubing, and kayaking in the Poudre Canyon. I am certain many of my extended family will remember the rafting trip I took them on during a family reunion in Rocky Mountain National Park.